Readers of the first edition of Beer, Brats, and Baseball: St. Louis Germans learned of Peter Heimig, a German immigrant who operated the Black Forest restaurant at 6432 Gravois Avenue in the late 1930s. Suspected of pro-Nazi leanings, Heimig got disgusted and brought his family back to Germany in 1939. We’ll read the rest of the story in the upcoming second edition. Nicholas Skaer, a great-grandson of Peter Heimig, got in touch and told me about his grandmother, Ingrid Favre, who was five when her father brought her back to German. Now eighty, she told her story over lunch Friday at Reifschneider’s Grill and Grape in Freeburg, Illinois, where she lives. 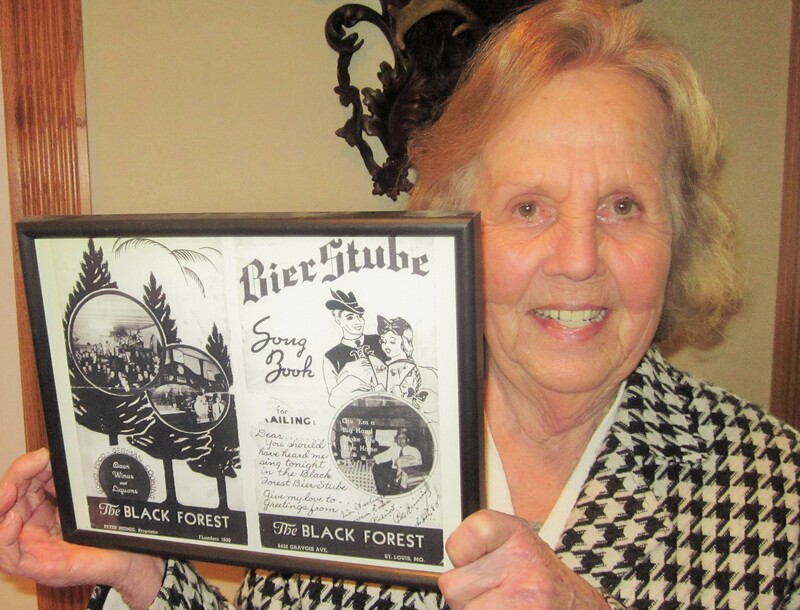 In the picture, she’s holding a framed copy of the Black Forest menu. Back in Germany, Heimig became a successful restaurant owner, but ran afowl of the Nazis when they discovered he had Jewish blood in him. He avoided a concentration camp because a friend in the SS told him to hide. After the war, Heimig lost a chance to return to America after a physical revealed he had contageous tuberculosis. Only Ingrid returned. The story of Peter Heimig, Ingrid Savre, and the rest of her family would make a great movie. You can read it when the Second Edition of Beer, Brats, and Baseball: St. Louis Germans comes out this summer. Let the French keep their melodious surnames. German last names have all the melody of an old school nun rebuking a talkative pupil, all the rhythm of a jackhammer tearing up a sidewalk, and the smooth sound of a barking affenpinscher. It was especially so of the original German immigrants, who hadn’t yet gotten around to shortening their names. Some have delightful hidden meanings, if one can associate “delightful” to a sound so gravelly. You’ll read all about it in the upcoming Second Edition of Beer, Brats, and Baseball: St. Louis Germans. We dug up some really odd German-sounding names of folks buried buried in the historic St. Matthew Cemetery at 4360 Bates Street in South St. Louis. We found such names as Antweiler, Bloedt, Freeburghaus, Kiesenwetter, Schlickenmeyer, Zimmenbuer, and Zuckschwer. The book will be out this summer. Plan now to pick it up.